White-Line Woodblock Printing is a print method which does not require a printing press or toxic inks. The prints are cut on a single woodblock. The colors, applied with a brush, are watercolors and a spoon is used to transfer the image onto the paper. This is a unique way to create original images of many colors. Suzanne will be giving a demo of this printing process. 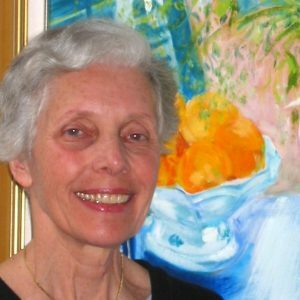 Suzanne Packer was the first Director of the Cape Cod Museum of Art, is a member of the collective known as 21 In Truro, was a founding trustee of the Cultural Center of Cape Cod, and is the recipient of the “Muse Artist Award for 2018”. Her oil paintings and white-line woodblock prints are included in museum collections.